Our employees are what make Northern Engraving and our customers successful. They reflect our core values of Trust, Respect, Innovation, Service and Teamwork every day. It is their hard work and dedication to excellence that make a difference. One person who displays these values is Deb Dishinger at our Sparta, WI location. 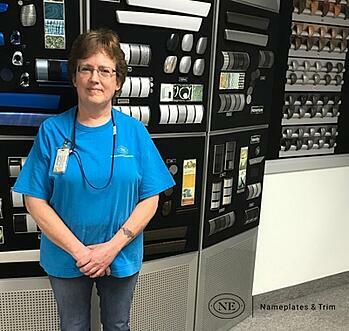 A stable work environment that would allow a working mother the peace of mind for good wages and the ability to be there for her children as they grew up is part of what brought Deb to work here. She has been a valuable asset in our Sparta, WI manufacturing plant moving from oven tending in the Spray Department to making screens in the Screening Department. We are glad to have her on the team! “I appreciate being given the opportunity to review the production schedule and determine the priority of the jobs to meet the needs of our customers. It has also been very neat to see how decorating techniques and processes have evolved over the years. There is a great deal of skill involved in manufacturing the parts we make. It takes time and patience to develop. Everyone appreciates when questions are asked to make sure that the process is understood. It is important to work together so that we have good parts to go out the door to our customers.